The blanket's satin edge can come loose, posing a strangulation hazard. The recall includes about 74,000 children's blankets. They are 14 inches square with a stuffed animal head sewn in the middle. The satin border around the outside edge is about 1 inch wide. 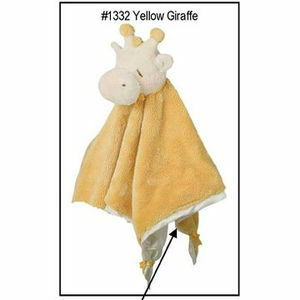 The recalled blankets were sold in 10 styles. The style number, followed by the P.O. number, is identified on a white tab sewn into the blankets behind the Douglas red label. Specialty stores nationwide and on the Web from April 2005 through December 2007 for about $12. Take the blanket away from children immediately and return it to Douglas for a free replacement blanket or credit toward another item of equal value. For additional information, contact Douglas Co. at (800) 992-9002 between 9 a.m. and 5 p.m. ET Monday through Friday, or visit their Web site at www.douglastoys.com, or e-mail the company at linda@douglastoys.com.